“Formation” begins with the attempt to engage with a lost childhood through words – but ultimately, it is a search for something deeper, the mining of then and now for a love that hovers, ever elusive. The search inspired a journey eastward, where inner and outer worlds collide. In their form, content and spirit, the poems in this collection reflect the varied landscapes of Southeast Asia, India and Japan. 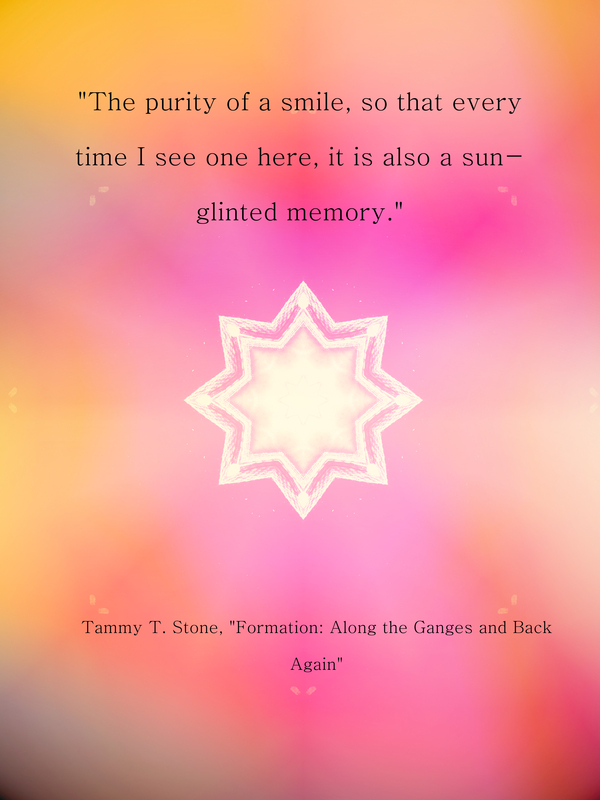 “Formation” takes the reader into the heart of the poet’s reminiscences and passions as they mesh with the lively physical, natural and spiritual spaces encountered. The poems of Land explore our bodies and selves as terrain to be navigated, accepted and loved. Where estrangement meets intimacy, where lost youth meets the inevitability of aging, where fear meets hope, where doubt meets empowerment, where the natural world and the elements as our precious teachers meet our readiness to dive right into our lives – these are the intersections that lie at the heart of this collection, which uncovers a great paradox of our times: adrift, we long to feel truly, completely at home, while knowing deep within that there’s nowhere else we can be; we are already there, exactly where we are. “Little Poems for Big Seasons” is a poetic exploration of Japan’s four seasons as experienced by a Canadian poet living in Japan. This collection contains 12 poems for each season, and will take you on a meditative journey through the seasons and the various imaginations that accompany them. “FORMATION” ART CARDS (AND POSTCARDS) HAVE ARRIVED! 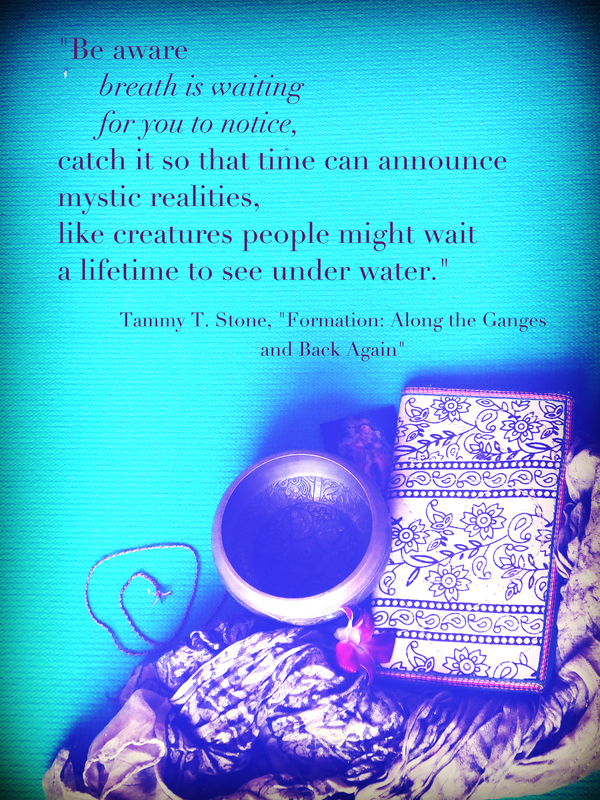 I’m so thrilled to announce that my poetry collection, Formation: Along the Ganges and Back Again is now officially forthcoming by Prolific Press, and I’m looking forward to updating you more about there where/when/how of it all. What is FORMATION: ALONG THE GANGES AND BACK AGAIN? 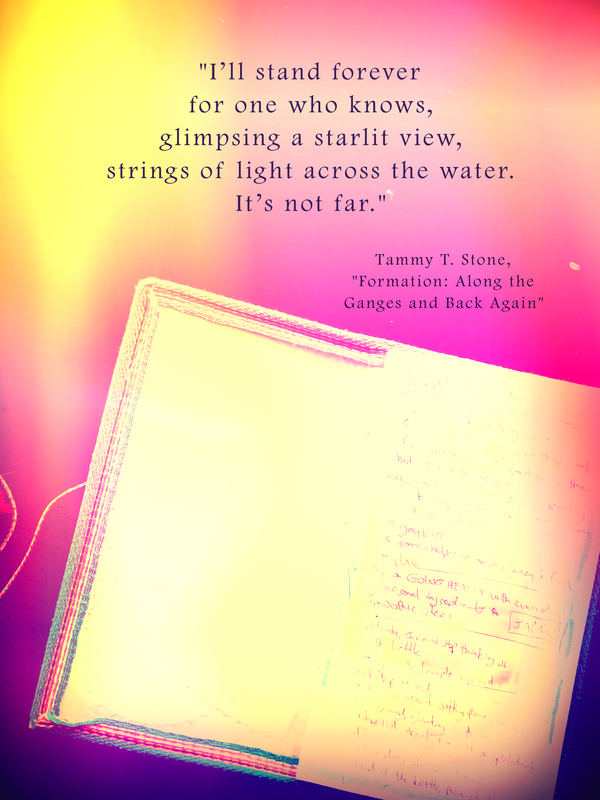 Formation: Along the Ganges and Back Again is a new poetry collection by Canadian writer Tammy T. Stone. This collection is a labour of love emerging from a long journey through Southeast Asia and India, culminating in a move to Japan, where she currently resides. I can remember standing high on a mountaintop in the Himalayas looking at trees and heavy clouds, just amazed at the thin-air splendor, and wanting to hear what everything around me had to say. I felt that this is how the world, and then we, become formed, or made, through this process of listening and communion. We don’t often make time to witness our own formation. “Formation”, for me, really captures this process of becoming that comes up repeatedly in the poems, both in terms of personal evolution and the artistic process. Adding the reference to the Ganges seemed very fitting, to alert people to the fact that the journey these poems chronicle are infused with a particular geographical orientation, too. My husband and I came back to several points along the Ganges many times in a three year period; we spent a lot of time there just trying to be, to form connections, and learn. Formation begins with a search for lost childhood and the attempt to find it through words – this search, I discover, is (always) the search for love, the mining of now and then for the love that is ever hovering and ever elusive. 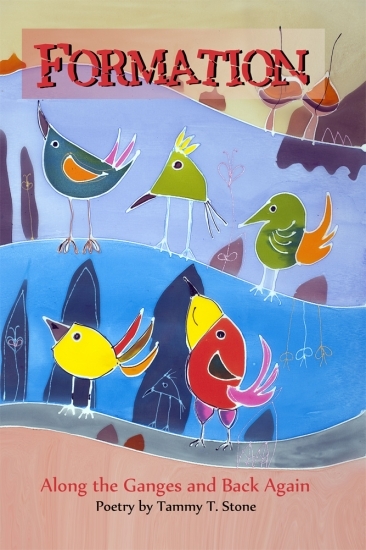 The search has me follow a deep impulse to journey Eastward, where worlds – inner and outer – collide. The poems in this collection reflected the respective environments of Southeast Asia, India and Japan in the poems’ content and form. 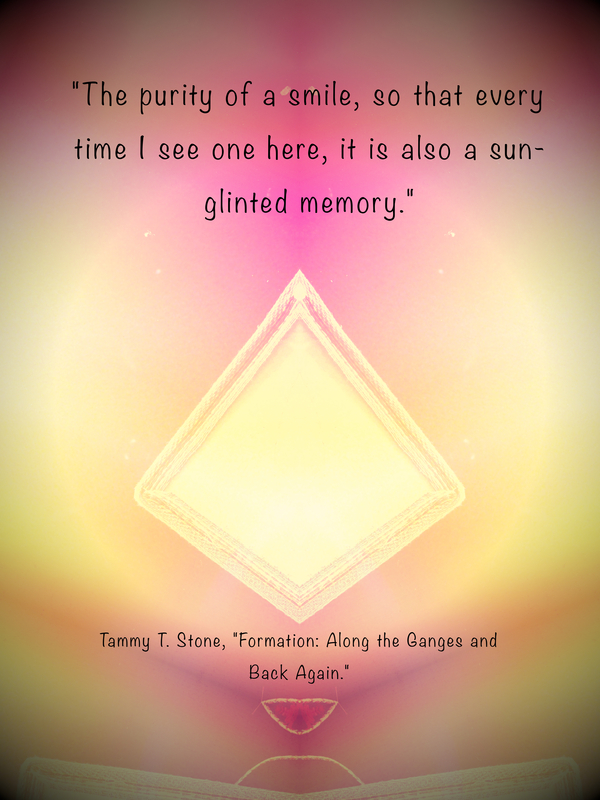 Formation takes the reader into the very heart of my dreams and reminiscences, passions and fears as they mesh with the lively and varied physical, geographical and spiritual spaces I encounter. When did you write these poems? I started travelling through Southeast Asia in 2010, and met the man who is now my husband a few months later. We were both looking to make some changes in our lives and were both already in the midst of making some pretty big changes in our lives. Kismet! We’d both dreamed of going to India for years, but hadn’t wanted to travel alone. Opportunity! We ended up spending around three years going between Thailand and Laos, and India, and I wrote all but the last section of poems during this time. The last section, of haiku, were written in the (rather disorienting) months after we arrived in Japan to “settle down” – for now! Did you write these poems with an eventual collection in mind? Nope! Though it’s always the dream … I wrote them because writing has always been a necessary and natural form of expression for me, and during this time, I had a deep impulse to use poetry as a form of expression, as I have at several points throughout my writing life. I was also writing lots of other stuff – in fact, I wrote a book-length manuscript of ‘daily pages’ from our six-month trip to India in 2012, a semi-autobiographical novel about a woman looking for her truths – and I also wrote many stories, and the beginnings of a few I’m still working on. The poems were very dear to me, though, especially because I was writing them on paper, pretty much on the go and constantly and moods and impulses hit, as opposed to the other stuff, written on my little laptop in the evening. What were your writing materials? Good question, I’m glad you asked! These poems, as I mentioned, were written on the road. Often, we were travelling with no more than one (stuffed) daypack each, for months at a time, in dusty, albeit spell-binding conditions; sparing space was essential. Luckily, I never lost my love of writing with a pen and paper, which is about as portable as it gets. I’m always on the hunt for the perfect journal(s), and have found many along the way. I also love making my own journals from good packaging – it allows me to recycle things we buy and use it in a way that gives me pure pleasure. I wanted small journals to carry around in my daypack, and I remember making one out of a mosquito coil box! I also found a great little journal way at the top of a Buddhist temple in Leh, Ladakh, India – it truly felt like the very top of the world. My husband and I met the (Japanese) monk who founded and built the temple, and attended a gorgeous meditation session with the most beautiful gong chanting I’ve ever heard. It felt like a really special place to find a journal to use for my poetry. How did this book come into being? I’d had a haiku published with Prolific Press previously, and discovered they were looking for poetry material. I had all this material that already seemed to have a natural trajectory, so I hunkered down, put it together, and had one of those rare and magical ‘aha’ moments about feeling something was intrinsically right about how everything fit. I sent it along, and the rest is history! I feel so lucky that Glenn Lyvers, at Prolific Press, believed in the work and wanted to offer me a publishing deal. Right now, I have two novellas and a few books for which I’m seeking publication, including two very different novellas about lost love. I’m also working on new novel based on my dream journals, and a memoir about my travels. Are you looking for writing work? Depends on the project, of course, but ask away! I have a bunch of articles up at elephant journal, which you can find here. I also write regularly for The Tattooed Buddha, and you can find my work here. And my blog, which you are already visiting! My e-mail address can be found here as well, in the “About” section. 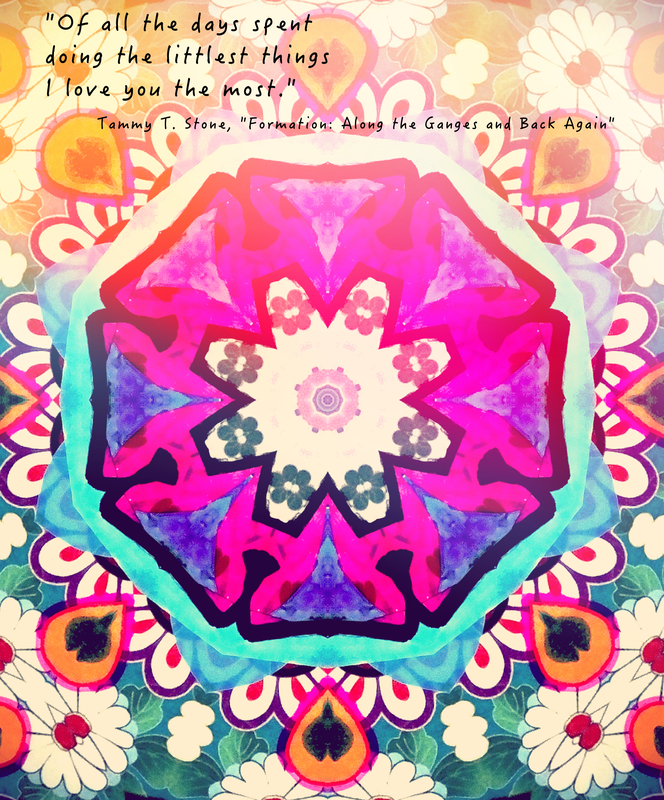 Thank you for sharing in my excitement over this poetry collection; it means the world to me. Thank you so much, Jaymes, for holding my words in your gentle space!